Plate hammer is the main wear part in the crusher. Its life time is subject to the kind and property of crushed materials. The plate hammer and rotator adopt the fastening form that trapezoid groove insert wedge in radial direction, the axial ends use pallet bolt for fixing. This form is easy to disassemble and assemble. 1. The plate hammer, designed with two trapezoid grooves, which can be replaced for three times and its utilization is around 60%. See the follow drawing. a. Loose wedge nut, twist hexagonal socket head bolt to move the wedge down to the lowest position, leaving the plate hammer from its seat for 5-10mm. b. Disassemble the block on hammer ends. 3. 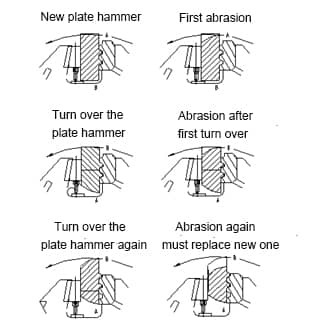 The new replaced plate hammer is A side, which closely contacts with the trapezoid groove 1, 2. After wearing 60mm, turning the plate hammer 180° , then B side is upward, contacts with trapezoid groove1, 2. After wearing 60mm again, lift the plate hammer in the second replacement, the second trapezoid groove 2 is empty. After the third wearing of 60mm, you must replace a new plate hammer.